This was my first time at the Convention and my first time in Vegas. All I did was paint, eat, and sleep. I didn’t have time to go to any shows or see any sights. I’ll save that for next time. I had six oil painting classes, and I managed to bring all six wet canvases home in my suitcase using some wet canvas carriers made of lightweight wood. I had two 16x20 paintings and four 12x16. I took along some foam board to protect the backs and some masking tape to tape it all together. Even baggage handling at the airport didn’t damage them. If you want to know where to get these wet canvas carriers, let me know, and I’ll hook you up with my contact. I painted “Out of the Mist” with Gini Deaton on Sunday evening, then on Monday I did an all-day with Robert Warren, painting “Red Hollyhocks,” Then on Tuesday, I had a wonderful time with Valerie Stewart, painting “Slumber Party.” Wednesday was another all-day with Robert Warren, where we painted “Sea of Serenity.” Thursday was a wonderful evening with Valerie Stewart again, this time painting “Glow of Innocence.” Needless to say, I was exhausted after those late nite classes! I elected to stay for Robert Warren’s post-Convention two-day workshop where we painted “Christmas Lantern,” one of my favorite paintings of the entire convention. I have placed photos below of all six paintings, but they seem to be cropped, and I can’t fix that here. To see the full photos, click on “Paintings”. Many thanks to all the fabulous instructors and organizers of the Convention. I really learned a lot that I can share with my students. On to the next adventure!! Thanks to Buddy Person of Careyville, TN for bringing Marion Dutton to the United States in April of 2018, many of her fans got to meet her and her very entertaining sidekick, Gary. Needless to say, we were starstruck when she first entered the room. I think our applause at first frightened and then embarrassed her. After the first half hour, we settled in to some serious painting, and she had us wrapped around her finger. A fabulous artist and even more amazing instructor, Marion has an easygoing style, and we all just fell in love with her and her Cheshire accent! She offered two three-day Pet Portrait Workshops where she patiently taught her version of the brunaille method of underpainting with burnt umber, similar to that used by the old masters, on Day 1. Day 2 consisted of blocking in colors, and Day 3 was the glazing and final touches. Most of us in her class of about 12 or so were experienced painters, but our mouths were hanging open at the end of the third day when we saw what we had accomplished. I took both of these classes back to back and would have kept on painting if she could have stayed longer! In June of 2018, Marion announced her MazArt Associated Painting Partner (MAPP) program. I immediately filled in the paperwork, attached all my credentials, and dispatched it on to the UK for approval. It wasn’t long before I received my official MAPP Certificate, which gives me the authorization to teach any of her projects I have purchased. However just having learned her method was the most valuable part of my association with Marion because I can apply her method to my own designs. 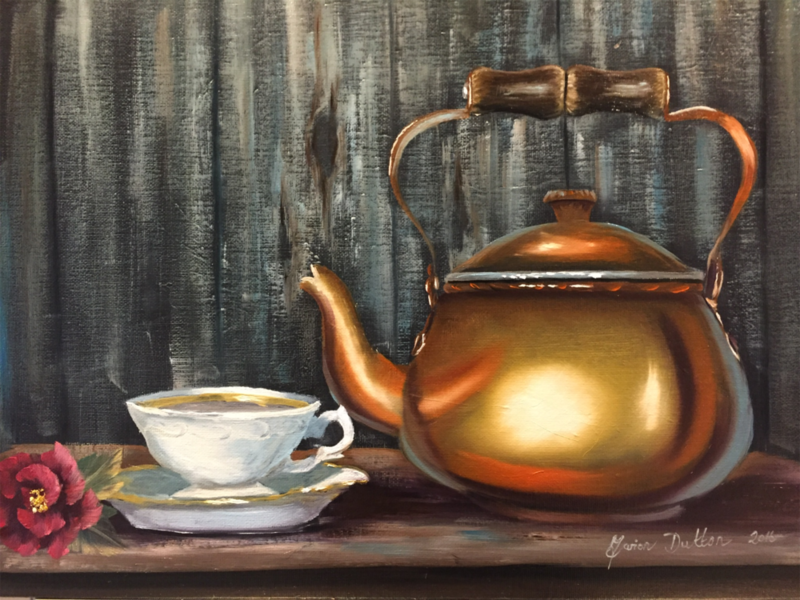 Marion returned to the states in October of 2018 for her Masterclass Still Life course, which involved her unique method of free-handing the initial sketch using geometric shapes and underpainting in brunaille. This was quite challenging, but once we “got it”, it was worth it. She offered two three-day Masterclasses and I took both of them. I am so pleased with both of those paintings that I have them hanging in my dining room. In April of 2019, many of us will return to Careyville for another MazArt Pet Portrait Workshop (or two for some of us), and I am really looking forward to painting with Marion again! In August of 2018, I had the pleasure of joining 11 other enthusiastic painters in a week of painting, learning, socializing and sightseeing with Wilson R Bickford, a fabulous art instructor in Watertown, New York. After learning and painting all day, Wilson and his lovely wife, Glenda, organized outings for the group. We went out to eat together one evening and on another day we toured Sacket’s Harbor and had some great ice cream. Another fun outing was a sunset boat tour of the Thousand Islands on the St. Lawrence River. I got to meet new and old friends as we spent a fabulous week studying to become official Wilson Bickford Trained Teachers. Becoming a WBTT was an honor for me. I’ve been watching him on YouTube and then later on his videos. Wilson made sure we understood his method and his line of brushes, paint, mediums, and surfaces. Yes, there was a written test and a couple of “paint something on your own” tests, which we all passed after studying our meticulous notes! Check out Wilson on YouTube, PBS, and Create TV as well as his website www.wilsonbickford.com. Happy Painting, y’all! Oh, I had a wonderful time painting with fellow CRI’s (Certified Ross Instructors) at the Bob Ross Gallery and Workshop in New Smyrna Beach, FL. this past November. Ellen Tye, one of Bob’s master instructors, led us in a week-long challenge, each day painting one of Ellen’s original designs done from her photographs. I had the pleasure of painting with her in November of 2016 as well as November of 2018. 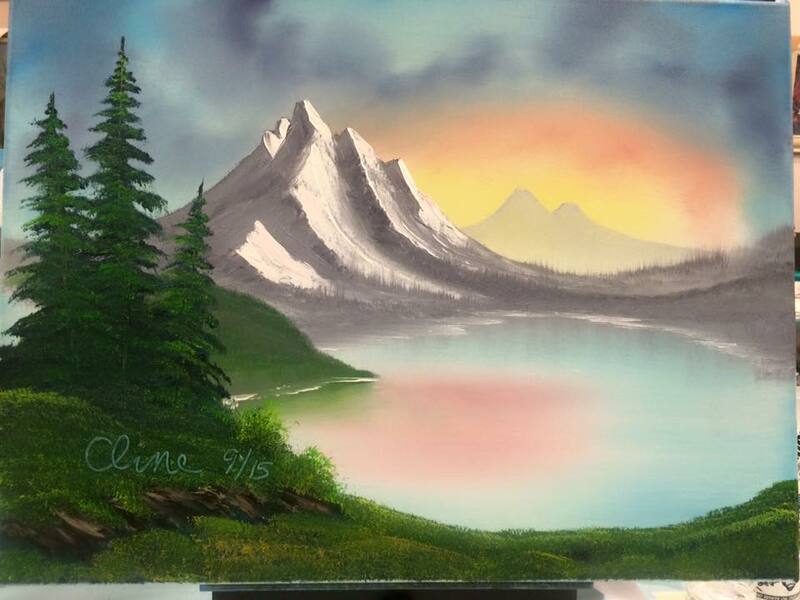 If you are a Bob Ross Certified Instructor, I would encourage you to converge with other like-minded CRI’s around mid-November each year and enjoy a week of some mighty fun paint slinging! 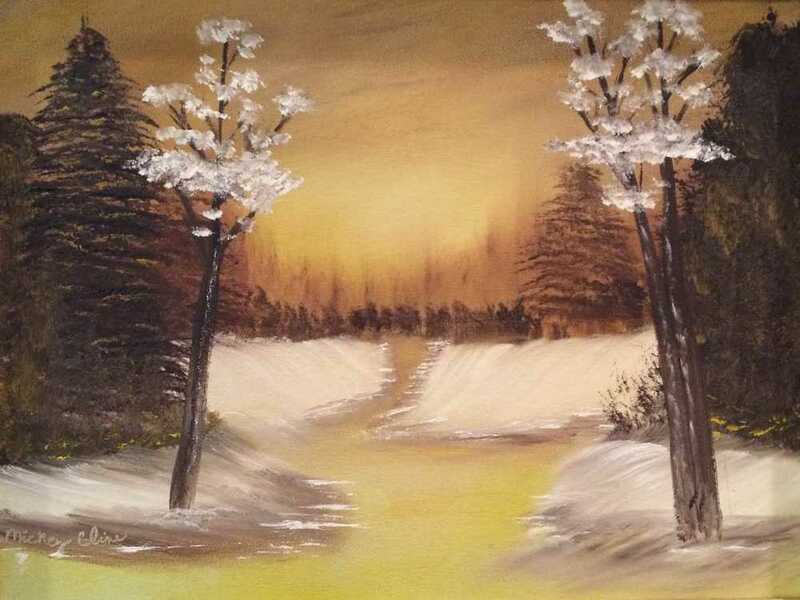 Look for the email from Bob Ross, Inc. around late spring or early summer announcing the dates. If you’re interested, you better sign up immediately because the first class fills up within a few minutes of announcement, and the second week fills up in a few days. Just sayin’. But get your name on the list even if it is filled in case someone cancels. Happy Painting, y’all! Yesterday, on November 11th, the first Happy Little Paintings class took place at the Hobby Lobby in Hixson, TN and it went great! I would like to thank Freida, Judy, Lillian, Rhonda, Charlotte, and my son Austin for being great students and making the first class a success. On to the next adventure!